The answer to that question will depend on the severity of the cavity. In cases where the cavity is discovered early, your dentist will want to perform a dental fillings procedure and have a conversation about the different types of fillings. When filling a tooth, the dentist begins by administering a local anesthetic to numb the area around the tooth to reduce or eliminate any pain. The dentist will isolate the tooth to prevent contamination and keep it dry by using some kind of guard or dental appliance. He or she will then remove the decayed area of the tooth with a tool designed specifically for both the severity of the cavity and its location in your mouth. This can include the use of a laser, drill or air abrasion instrument which the dentist has received extensive training on. Once the decay has been removed, the dentist will prepare the tooth for the filling by thoroughly cleaning it so you won’t have any bacteria, decay or debris causing future problems. The dentist will apply the filling material, which may require a special light to cure or harden the product (see types of fillings for more information on this). In the final step of the dental fillings procedure, the dentist will test your bite to ensure proper alignment and then polish so the filling is as smooth as your other teeth. There are a number of different materials your dentist can use to fill your cavity. Below is a list of the common types of fillings. This type of filling has been used for more than a century and consists of a mixture of metals including mercury, tin, copper, silver and zinc. Durable and long lasting, they are also one of the least expensive options for filling. Because they have a dark, metal color, they are easily seen, so most dentists and patients prefer a tooth colored filling instead. 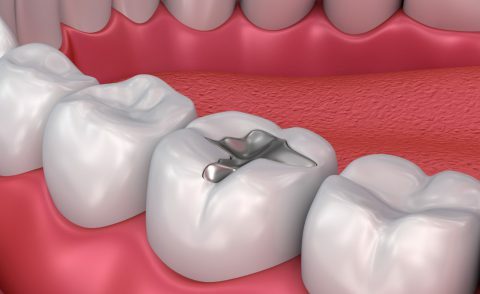 Because these types of fillings contain mercury, a known toxic substance, concerns have been raised about their use and connection to resulting disease. However, the ADA (American Dental Association), as well as other public health organizations, have officially declared there is a lack of proof that amalgam fillings cause any harm to consumers. The amount of mercury present is minute, and when mixed with the other metals, creates a stable alloy and has been used safely in millions of dental fillings procedures. Gold has long been recognized for its strength. While gold fillings will usually last longer than any other option, they are the most expensive option. Some of the disadvantages, other than cost (and insurance companies unwillingness to pay for them), include their visibility, and the potential for a galvanic shock – a phenomenon that creates a temporary sharp pain when placed next to a silver filling or a saliva interaction. Both are rare. But, if you want to spend less time in the dental chair and aren’t opposed to spending the money, gold is an enduring option. A composite is made from a mix of powered glass and acrylic resin. Composite tooth fillings have become more popular as they can be color- matched to your natural tooth, making them very inconspicuous, especially in comparison to metal alternatives, gold and amalgam. They are less durable than their metal counterparts, however, and can chip. However, because they bond to the tooth, they can provide support others fillings don’t, and they don’t require as much of the tooth to be worn down in the dental fillings procedure. Porcelain fillings also have the benefit of a more natural appearance, but are also more fragile than metal fillings, and tend to be pricier. They will typically require more than one visit to the dentist because they are often created in a laboratory and then placed on your tooth. These types of fillings are most often used for small areas of decay, such as for children, or below the gumline. They aren’t placed in areas subject to chewing or extreme pressure as they are rather delicate. If you find yourself diagnosed with a cavity at your next dental check-up there are many different types of fillings to consider. You’ll want to speak with your dentist to decide which type of filling will be best for your dental fillings procedure. Find a PERFECT TEETH dental office in Colorado, New Mexico, or Arizona today or call us at 844-717-9588 for more information. Reviewed by PERFECT TEETH Dentist, Dr. Krupa Soni of PERFECT TEETH – Ken Caryl.